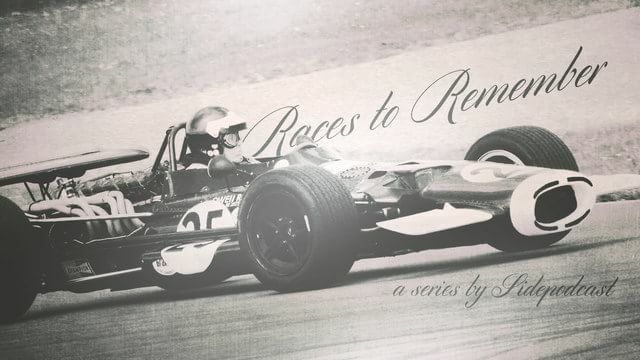 Welcome to a brand new series of Races to Remember – the Sidepodcast mini series that looks back at the highs and lows of a lengthy Formula One history. With the first championship race held in 1950, there’s a wealth of choice when it comes to selecting the most memorable events. For this series of seven episodes, I’ve hand-picked the record-breaking races – longest, shortest, closest, wettest, there’s a little bit of everything. This first episode takes a look at a race with a very high attrition rate, Monaco 1996. The Monaco Grand Prix is always a special one for F1 drivers – the historic surroundings, the unique setting, and the sheer challenge of the street circuit make it one that everyone wants to win. In 1996, Monte Carlo was the host of the sixth round of the season, six of sixteen events that year. Damon Hill was leading the championship, with his Williams teammate Jacques Villeneuve 21 points behind him. Defending champion Michael Schumacher, newly installed at Ferrari, was sitting third. The German spun his car during practice, ending up at a standstill at Rascasse, but he recovered to set pole position on Saturday. Hill lined up alongside him on the front row of the grid, with two Benetton cars behind them. There was rain ahead of the race and in the warm up session on Sunday, during which last qualifier Andrea Montermini crashed his car coming out of the tunnel. The Forti team had no spare car, so Montermini’s day was over before it had begun. The first lap at Monaco is always chaos and this year was no different. The wet track made life very difficult for the drivers but Hill made a pass on Schumacher for the lead very early on, and made it stick. Michael had no opportunity to come back at him, though, as he crashed into the barrier and retired from the race. Rubens Barrichello was out on the first lap, Giancarlo Fisichella and Pedro Lamy crashed their Minardi cars into each other, whilst Jos Verstappen also crashed into the barrier. With just one lap completed, we had one non-starter and five retirements. Two more drivers retired on the next two laps after spinning off, and before the tenth lap, we had two more DNFs due to car reliability. Those that were still running included David Coulthard who overtook a struggling Heinz-Harald Frentzen. In the Sauber, Frentzen had already had a collision, so that after losing the place to DC, the German came into the pits for a new nose. The rain had stopped by this point, easing off and allowing more racing to occur. Hill pitted from the lead, handing first place to Jean Alesi. Many drivers followed, but Alesi stuck it out on the wrong tyres for too long – Hill passed him to retake the lead and left the Benetton for dust. Future commentator Martin Brundle retired from the race on lap 30, spinning into the barrier and then rolling back across the track to land safely in the run off area. At the notorious hairpin, there was a collision between Eddie Irvine in the Ferrari, and Olivier Panis in the Ligier – Panis forced his way past the red car, leaving Irvine stationary. Eddie almost called it a day, starting to make a move out of the car, but when the Ferrari started rolling again, he settled himself back in for some more racing – after a quick pit stop for a new nose, of course. Race and championship leader, Damon Hill, found his afternoon come to an early conclusion when smoke started issuing from the back of his Williams. He came out of the tunnel and ran off track, retiring with an engine failure. It was his first retirement of the year. Jean Alesi came in for a slow pit stop that dropped him back, and although he headed out for one more lap, he was soon returning for the car to be pushed into the garage. Another race over. Meanwhile, those retirements put Olivier Panis in the lead, with David Coulthard second for McLaren. As the race drew near its conclusion, there was just time for Luca Badoer to squeeze Jacques Villeneuve into the wall, knocking both of them out of the race, and for a three car pile up. Eddie Irvine spun at the same place as his Ferrari teammate, and was busy trying to correct his line when Mika Häkkinen barrelled around the corner and crashed into the back of him. Mika Salo was following too closely behind his namesake, and joined the train of damaged cars. With so many incidents, the race ran to the time limit instead of the complete distance, and the chequered flag was waved after two hours. Olivier Panis won, an unlikely victory for the Ligier team, with Coulthard second and Johnny Herbert finishing up the podium. They were the only three drivers to finish on the lead lap. Heinz-Harald Frentzen saw the chequered flag one lap down, and that was it. The three of Salo, Häkkinen and Irvine were classified finishers although they didn’t cross the line, with the remaining 14 drivers all retiring from the race. The Grand Prix may have been an exhausting one for viewers and drivers alike, but in terms of the championship that year, it made little difference. The top three all failed to finish so there was no change for them. Panis moved up to fourth on the strength of his victory, but by the end of the year he was back down to ninth. Thanks for listening to this episode of Races to Remember. Don’t forget that you can have your say on the race, if you remember it or have heard tell of its legendary status – just leave a comment on sidepodcast.com or leave a message on the contact form, sidepodcast.com/contact. And, finally, join me tomorrow for another record-breaking Formula One race.